In today’s world of increasing mobility and real-time communications that are now possible, people of all religious and non-religious traditions hear about each other and come into contact with each other as never before. They are our friends, neighbors, and colleagues. These every day human interactions require us to understand, communicate and cooperate with each other like never before. 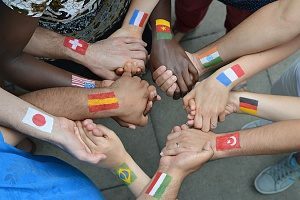 Interfaith cooperation allows different cultural and religious groups to interact with each other directly and keep tensions and distrust at bay. Respect for individual religious or nonreligious identity. Respect for identity means that everyone can bring their full identities to this work. Everyone is welcome. No one is excluded based on their beliefs about their own faith and the faith of others. 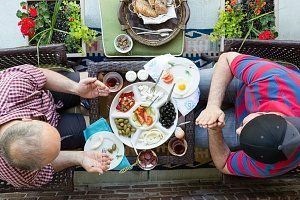 Interfaith cooperation is not syncretistic or relativistic – no matter your views, whether religious or non-religious– interfaith cooperation has room for you. Mutually inspiring relationships. Interfaith cooperation encourages building of relationships across the boundaries of faith and atheism. It fosters opportunities for real conversations about disagreements. Ideally, everyone gains from these relationships. Common action for the common good. When people seek to make the world a better place by working on projects that help others, those shared values enable them to connect with each other. Working in furtherance of those values allows people across religions and nontheist backgrounds to achieve a common goal, regardless of their different theist views, for the benefit of their communities. Learning about the others’ history. Developing an appreciation of the other. Living up to our core theological principles and values. Overcoming fear of those with different beliefs. Those who invite interfaith cooperation believe it promotes understanding between people of different beliefs and acceptance. However, traditional believers oppose it on various levels out of concern it will synthesize new beliefs. Better Together Campaign: IFYC’s Better Together campaign has been successful at inspiring students from different religious and nonreligious backgrounds to come together to work for humanity. One Better Together event occurred on the 10th anniversary of 9/11 at the Humanist Chaplaincy at Harvard University. The Tufts Freethought Society and representatives of religious and nonreligious communities in the greater Boston community brought together two hundred volunteers. They surpassed their goals by packaging 10,000 meals for disadvantaged youth in Boston and waged a letter campaign to Massachusetts’ representatives in Congress requesting that funding for hunger relief programs not be cut. UN World Interfaith Harmony Week: With unanimous approval, the UN General Assembly declared the first week of February each year as the UN World Interfaith Harmony Week. It is now a UN Observance Event. Religions for Peace International: Founded in 1970, Religions for Peace International is the largest international coalition of representatives from the world’s great religions dedicated to promoting peace. The organization advances common action among the world’s religious communities for peace. It tries to transform violent conflict, advance human development, promote just and harmonious societies, and protect the earth. The global Religions for Peace network comprises a World Council of senior religious leaders from all regions of the world; six regional inter-religious bodies and more than 90 national ones; and the Global Women of Faith Network and Global Interfaith Youth Network. 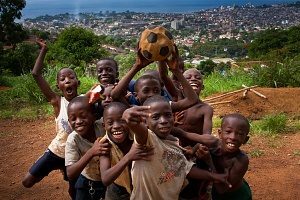 Reconciling Conflicts: Religions for Peace, with its national affiliate Inter-religious Council of Sierra Leone helped end the bloody civil war in Sierra Leone and mediated negotiations between the government and the rebels. The Council became an important conduit in the peace process, negotiating the release of fifty child hostages in 1997, and playing a key role in the Lomé peace talks. In the following three years, the Council conducted a human rights and peace education project designed to contribute to a nationwide dialogue on human rights. Fighting Preventable Disease: The Religions for Peace organization has been active in fighting serious diseases in African countries. Working across the boundaries of faith, they have helped stop epidemics, provided support and food, and waged successful sanitation education campaigns. At Fairfax Christ Lutheran Church, Pastor Paul has been very active promoting interfaith cooperation, in reaching out to culturally diverse communities, and in global mission through many years of relationship with Lutheran Churches in Mexico and Central America. Contact Pastor Paul for information about how you can serve the community through interfaith cooperation.